It is difficult to make generalizations about such a large area as the Baltic Sea, but many of the ports contacted by DCI reported eitherstaticdrybulktraffic,orevendecreases. Whilelocal issues impacted on performance, the continuing downturn in the Russian economy is clearly influencing events in the region, as export Russian raw materials benefit from a weak rouble, while imports become unaffordable. In 2015, cargo handled at the ports of Szczecin and S´winoujs´cie was similar in volume to the previous year. Both handled a combined 23.2mt (million tonnes). In terms of dry bulk, traffic amounted to 9.3mt compared with the 10.7mt reportedfor2014,equivalenttoadecreaseof13%. Thiswas due to a drop in coal traffic (–32%), grain (–4%) and iron ore (–1.5%). In respect of coal, part of the existing traffic moved to other ports. However, general market trends were also to blame, notably a drop in the Baltic Dry Index (BDI), which reflects a slowdown of growth in China. Not all commodities decreased. Fodder and oilseeds, for example, rose 16%, while fertilizer went up by 4%, in line with greater demand from the agricultural sector. direct beneficiary of EU funding. In 2007–2020, it has either spent,orplanstospend,nearly$513million. Theemphasishas been primarily on improving the accessibility of both ports, since this has a major impact on their competitiveness in the transportmarket. Thereforenewquayshavebeenbuiltandthe transport infrastructure modernized. “In recent times, we have also modernized road and rail infrastructure, rebuilding, for example, nine kilometres of roads. In addition, new waiting areas have been provided for trucks, amounting to 600 new places in five areas across the two ports”, says Karolina Bierdzinska, the port authority’s Communication and PR specialist. The railway infrastructure project has focused on rebuilding and modernizing nearly 36km of track and 134 sets of points. The track was adjusted to handle rolling stock used on the international E-59 and CE-59 trunk routes, which has significantly helped to improve the dry bulk handling service provided. In 2015, the port authority also finished rebuilding quays in the grain handling area in Szczecin. The Zboz?owe Quay was modernized, while a brand new facility, the Niemieckie Quay, was built. unload two smaller ones,” said Bierdzinska, pointing out that plans exist to dredge the fairway to 12.5 metres to enable larger vessels to call there; 40,000dwt ships are eventually expected to use the terminal. In addition to the port authority, private operators are also investing in the improvement of services. 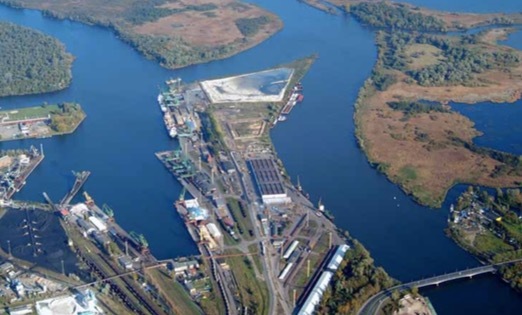 A new company, Szczecin Bulk Terminal Ltd, is to begin operating at the modernized Zboz?owe Quay, making use of the existing concrete silo complex, which is the biggest one in the port. The terminal will be upgraded in 2016 to operate fully automated silos with a total capacity of 55,000 tonnes, this will make it possible to handle various bulks for both import and export. The terminal is also equipped with a comprehensive pre- cleaning technology. Loading of vessels is performed at a maximum rate of 1,000tph (tonnes per hour) using a mechanical system, while pneumatic unloading can be achieved at a rate of 300tph. Another operator in Szczecin — Bulk Cargo Port Szczecin Ltd — specializes in a variety of commodities, including coal, coke and agribulk and has recently widened its range of services, opening a new warehouse for soyabean meal in 2014/2015, boosting turnover by a further 100,000 tonnes per year. The various silos in the Szczecin–S´winoujs´cie port complex allow it to store up to 230,000 tonnes of agricultural products. “The biggest future challenge for the port complex is the new outer port area in S´winoujs´cie, where a new LNG terminal is located on the eastern part of the outer port. The western side, however, is dedicated to a variety of port activities, including dry bulk. Since various new berths are there, the outer port will decisively increase transshipment capacity for both ports, as well as being able to handle larger vessels,” notes Bierdzinska. Asked whether there are any new commodities that the port authority would like to attract, she points out that, at present, the port is able to cover all various market requirements and currently has enough capacity flexibility to cope with all demands. But in the future, the port authority is planning to enhance capacity by creating new terminals, in both the outer port in S´winoujs´cie, as well as at Ostrow Grabowski, in Szczecin, which is its main development area. In terms of overall size of vessels deployed on dry bulk trades, she notes that Szczecin, 68km inland, is some distance away from S´winoujs´cie. Therefore, it can only handle vessels drawing up to 9.15m of water, which translates into vessels of around 30,000dwt. In contrast, S´winoujs´cie is on the coast, so has no such restrictions. It offers a maximum draught of 13.2 metres, allowing ships of up to 100,000dwt to call. “The intention to dredge the 68km fairway from S´winoujs´cie to Szczecin to the depth of 12.5 metres should be seen as being as important as the dredging to 14.5 metres of the access channel to S´winoujs´cie and between the entry to the outer port basin and the Portowco´w Quay,” adds Bierdzinska. Both ports also add value to the basic raw materials, including offering such services as weighing, packing and sorting. In respect of land side movements of dry bulk consignments, this is done almost exclusively by rail, with some shipments making use of inland waterway. Figures are not yet available for 2015, but those for 2014 show that rail handled 45.7% of all cargo, barge 4.2% and road 50.1%. For non-road haulage to increase, the navigability of the Oder River is very important. Although it is a natural waterway, due to many years of negligence, its potential still remains underutilized. However, examples of other ports such as Hamburg and Antwerp show that inland shipping is an excellent complement to services provided by ports. Similar solutions, it is hoped, can also be applied in the Szczecin–S´winoujs´cie port complex. really worth doing, since the development of navigation on the Oder will provide Szczecin and S´winoujs´cie ports with access to three affordable modes of transport: sea, inland waterway and rail,” says Bierdzinska. Further to the east, the Port of Gdynia handled just over 6mt of dry bulk in 2015 as compared to 5.004mt in 2014. This performance was all the more remarkable given a decrease in the amount of coal handled from 2.1mt to 1.4mt, which Harris Mawusi, the port’s specialist in Development Projects, notes was a direct result of the low rate of the Russian Rouble, which made buying Russian coal eminently more affordable, at least, in the short term. However, this loss was compensated for by the increase in the handling of cereals, which grew from 2.9mt to 3.7mt. “The main reason why this slight increment took place can be traced back to investments made in developing port infrastructure,” says Mawusi, who points to the reconstruction of the Swedish Quay, which enables the port to handle Panamax vessels with draught up to 13.0 metres. In addition to the Swedish Quay development, an ultra- modern fodder/grain warehouse with a capacity of 60,000 tonnes was also built on the premises of Maritime Bulk Terminal Gdynia (MTMG). Moreover, the dredging and deepening of the port’s access channels to a depth of 16 metres is planned to be implemented in 2018–2020. This will enable Gdynia to receive bigger vessels, especially larger bulk carriers. As for possible new commodities, Mawusi points out that market conditions and demand will determine whether these are introduced or not. However, he adds, being a universal port, Gdynia can handle any type of cargo at its highly-specialized terminals. In terms of size, Gdynia receives calls mostly from Panamax vessels in the dry bulk market, but does occasionally also handle partly-loaded 180,000dwt Capesize vessels. “We are not just a raw material handling port, though. Value- added services are available on request, and these include sorting, mixing, big bagging, sifting, screening, classifying, grading, and matching,” he says. Rail has a significant role to play in landside movement of both coal and fertilizer for both import and export. All other dry bulk cargo is mainly transported by road. In 2015, Riga Freeport, in Latvia, handled 23.3mt of dry bulk, down 2.7% on the previous year, although this market segment is by far the largest in the port, with coal exports alone accounting for 36% of total traffic. The downturn is attributed to growth in dry bulk volumes at the competing Russian ports of Ust-Luga and Primorsk. Last year, Latvia experienced its largest ever grain harvest, with grain shipments topping the one million tonne mark for the first time, which represents a 36.6% increase. “Due to the intensive operation of the new fertilizer terminal, there was an increase in the turnover of chemical cargoes, too,” notes Edgars Suna, Deputy CEO, Director of Department of Marketing at the Freeport of Riga Authority. Positive dynamics were also observed in the shipment of woodchip (+24%), peat (+16%) and in other bulk cargoes. In contrast, the amount of sugar shipped was down by 100%, while there were also falls in the amount of construction materials (–45.7%), ore (–44.5%), various metals (–33.7%), sawn timber (–11.3%) and coal. completed an infrastructure objective that formed part of the framework ‘Development of Infrastructure on Krievu Island for the Transfer of Port Activities from the City Centre’ document. This project is one of the largest ever infrastructure projects in Latvia, with €133.65 million invested. Of this, the EU Cohesion Fund stumped up €77.19 million, with the port authority providing €56.46 million. Work consisted of building four dry bulk berths totalling 1,180 metres, allowing ships drawing up to 15.5m of water to be accommodated. In addition, necessary road and rail links were provided, along with utilities and communications facilities. “The total capacity of the Krievu Island project is 20mt of bulk cargo per year. Approximately 35% of cargo at Riga Freeport will now be transferred away from the city centre,” says Suna. Because of these new arrangements, cargo distributed along the banks of the River Daugava will henceforth be balanced, providing much needed relief for the city centre, including diverting much road and rail traffic away from congested areas, as well as reducing noise and coal dust pollution. Asked whether there are any new commodities that the port authority would like to attract to Riga, Suna explains that the philosophy is to maintain overall multi-functionality. “The dynamic nature of the market plus an increase in competition from ports in the Eastern part of the Baltic Sea is forcing us to look into attracting new types of cargo, while at the same time maintaining existing commodities,” he says. As an example, he points to one of the newest dry bulk terminals in Port of Riga: the Riga Bulk Terminal. Officially launched in February 2014, it is one of the most modern agribulk terminals in the Baltic Sea region. Based in Kundzinsala, the facility can handle a diverse range of bulk commodities, including grain, aluminous ore and sugar, with bulk handling sales anticipated to reach one million tonnes annually. Indeed, despite existing terminal capacity, which allows up to 70 different dry bulk cargoes to be handled, Riga port remains interested in attracting various new types of dry bulk cargo, with Suna citing alumina as an example, along with new types of grain and agricultural products. The recession in Russia as well as restrictions in trade between Russia and the EU, USA and other countries, has had a big impact on many Baltic ports as they handle a large portion of the consumer goods bound for the Russian market. Despite this, he believes that the dry bulk cargo segment will maintain positive growth and that coal will continue to be the most important dry bulk commodity. “However, being aware of the potential impact on the relationship between the EU and Russia, as well as on the political decisions in Russia to boost dry bulk cargo volumes handled in Russian ports, Riga port forecasts a slow, long-term decline in coal volumes handled,” he says. Riga sees mostly calls from Panamax bulk carriers. The largest ever vessel to call there was the UBC ONSAN, which could carry 112,000 tonnes of coal, having an overall length of 260m. In addition to its role as a pure handler of raw materials, Riga Freeport does provide some value-added services, such as bulk packaging, rubber processing, cargo weighing, road and rail scales, forage cereal packaging, grain and oilseed disinfection, as well as coal sorting, crushing and magnetic separation. In terms of landside movement, sea, road and rail are all used, although 80% of dry bulk is transported to/from the port by rail, the other 20% going by road. In Sweden, the Port of Hargshamn saw its dry bulk traffic drop to just 622,000 tonnes in 2015, compared to the 1.5mt reported for 2014. Port managing director Curt Nilsson explains that this was due to the biggest client, Dannemora Mineral (DMAB) — an iron ore mining company operating some 40km distant — being declared bankrupt in March 2015. The previous year, this customer had generated traffic of 1.2mt of iron ore.
“Nevertheless, throughout 2015, we continued to invest in a variety of small infrastructure projects,” he says. At present, the focus is on trying to increase the handling and storage capacity of grains, whilst also continuing to handle project cargo along with building equipment and materials, for which in port storage facilities exist. As for commodities in long-term decline, Nilsson identifies peat briquettes, pointing out that this is a controversial fuel, and will almost certainly be phased out most within the next five years. In terms of vessel size, Hargshamn normally handles ‘Baltic size’ cargo ships, ranging in size from 1,000dwt up to 23,000dwt (Wagenborg’s ‘R’ ships). In addition, there is also some small barge traffic. As for adding value to the basic commodity, Hargshamn does pack peat briquettes into containers, and also packs some commodities in big bags for some clients. So-called ‘firewood’ is also processed into woodchips. consignments, while others move by road. “This year, we are forecasting that more cargo will move by rail to and from the port,” said Nilsson. In neighbouring Denmark, the Port of Kalundborg reported dry bulk traffic amounting to 1.2mt in 2015, compared with 980,000 tonnes for 2014. Spokesperson Liselotte Rørup explains the 22% increase on the fact that the port has deep water facilities and also because the price of grain has been higher when shipped out on larger bulk carriers. Export wheat has, in particular, grown noticeably in volume for exactly this reason. “At the moment, we aren’t making any significant new investment in dry bulk infrastructure, although we are targeting more fertilizer traffic,” she says, pointing out that this has so far appeared to be in long term decline. Kalundborg can currently accommodate up to Panamax-size vessels, which are sufficient for the size of consignments currently being shipped. “In terms of adding value to the dry bulk commodities that we handle, there is a privately owned packaging factory for salt and pellets within the port area,” she reports. to-vessel transfer within the port, which sees some commodities moved from larger bulk carriers to smaller vessels for onward delivery of cargo. Also in Denmark, the port of Rønne is one of the smallest in terms of dry bulk operators in the Baltic Sea region. In 2015, for example, it handled just 813 million tonnes, compared to 810 million tonnes the previous year. According to Ulla Kiersgaard, Manager Maritime Services/Business Development, although some traffic segments within the port did vary from one year to the next, this was not the case with dry bulk. As a result, no short term investment is needed in developing additional dry bulk facilities. “The traffic that we can attract is limited to the size of the island where the port is located,” she notes, although stresses that none of the commodities handled should be considered to be in long term decline. As for landside movements, these are undertaken uniquely by trucks and tractors.